It’s beginning to look like a merry Christmas for Hayden Mundy Moore. On vacation from providing her sought-after expertise in all things chocolate, Hayden heads to snowy New England with her friend and financial advisor, Travis, for the opening of his pal’s highly-touted holiday musical. But when the show’s producer is murdered, Hayden trades sampling Chocolate Santas for finding the killer—especially since this time, Travis is the one asking for her help . . . Soon Hayden discovers there’s more to Travis’s chic hometown than mulled wine and cocoa cookies. But that’s just the beginning. Almost no one, including Travis, is quite what they seem. Did the show’s lead have more savage motives than stardom? Could the dead producer’s husband have felt a murderous envy for his successful wife? 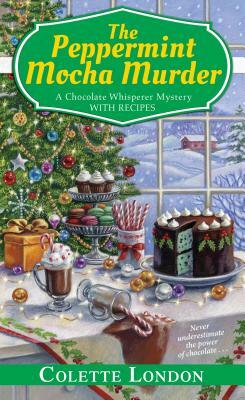 Getting behind the mistletoe and jingle bells will take all of Hayden’s savvy—along with some super caffeinated Peppermint Mochas—if she hopes to catch a killer with a heart more bitter than the darkest truffle . . .